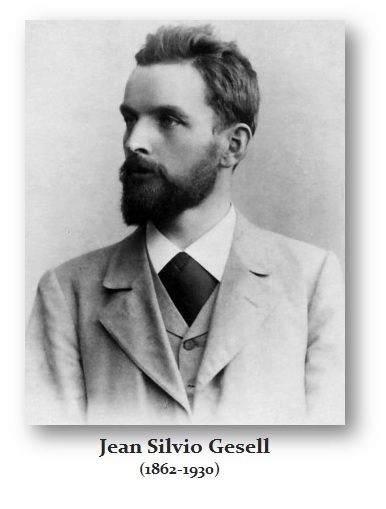 Jean Silvio Gesell (1862-1930) was a merchant and a theorist of the finance in Argentina and Germany. He was born in Sankt Vith, which was at that time Germany (today Belgium). His mother was Catholic and his father Protestant. His father was the tax collector of the German Empire when he grew up. Silvio Gesell became an ethical vegetarian and actually considered himself a true citizen of the world which was not owned by a government but in his view was the planet as a whole which belonged to all the people. He saw no differences of religion, race or social class among people that we were in fact at the core, all the same. Perhaps being raise by two parents who the world proclaimed their religions were at war combined with a father who collected taxes for the Empire, blended together to allow him to see through the veil and into something different altogether. Gesell’s economic thought appears to have been shaped by his upbringing. He saw that government sought to divide people for personal power and this was in contrast to the interest of individuals which is closer to Adman Smith’s Invisible Hand. Gesell developed a view that the individual was natural, healthy and good motivation to act for his own self-interest. The satisfaction of particular interest thus motivated productivity. The economic system, he concluded, should serve to meet these needs of the population, however it evidently fails to achieve this goal. Gesell proposed an economic system that he called a Natural Economy. Obviously, Gesell did not reach fame or influence for his ideas were antagonistic to Karl Marx who empowered government against the people as his solution. Like Adam Smith, Gesell also took into consideration “egoism” as a motivating factor that should be considered. Indeed, this plays a roll motivating people in different ways for it depends upon what they “believe” constitutes their personal self-worth. Gesell therefore concluded that there must remain open the opportunity equal for everyone to create businesses. He then concluded that to achieve this goal we should abolish all legal and acquired privileges typically created by government for friends. Everyone should rely upon their own individual skills and abilities to earn their living in life. Gesell saw this economic freedom of equality to create as the true “Natural Economic Order” and that people with greater talent will inevitably earn higher incomes regardless of the benefits of the interest, rents or currency speculation. This stood in contrast with Marx who despised anyone who had more material wealth than he did and characterized everything as the exploitation of labor rather than creating the opportunity to work for those with less talent or no interest to create and manage a business. Gesell did not advocate an individualistic system but believed that it should reduce the gap between rich and poor to approach the “Natural Economic Order” by allowing the system to freely move without interference by the state. To a large extent, this was also laissez faire. Gesell founded the doctrine of the Free Economy also known as Freiwirtschaftslehre which was aimed at harmonizing private enterprise with features that ensure the free and popular access to resources. In 1906, wrote his most famous book, The Natural Economic Order. Gesell is known especially for his idea that a currency will depreciate over time, which should take place at scheduled intervals. In reality, this is a negative currency system. Gesell’s idea was based upon the concept that the problem of monopolistic hoarding property itself becomes not private property but the legal monopoly of money. Gesell argued that to issue voluntary (and local) currency would develop local paying jobs. The money would be issued only for a limited period and then expires. This would prevent money from behind hoarded. Gesell’s system was interesting with its primary goal to stimulate productive investment and credit. This actually distinguishes money derived by interest from the return of money invested in real wealth generation by investment. Gesell assumed that this would promote spontaneous and natural popularization of private property. In order to stimulate natural circulation of wealth instead of speculative hoarding of money, Gesell proposed the “oxidizable tickets” (money with negative interest), to bring an “organic reform” of the monetary system. With the money behaving like “real” material wealth, distortions in the system caused by hoarding and other forms of usury would be suppressed. This, he argued, would result in people receiving the full proceeds of his own work, and allow large segments of the population to escape from wage slavery and work in an autonomous manner in private and cooperative businesses.